Happy Autumn! We celebrated the new season by taking off to Holland, Michigan, about an hour's drive from our house. We camped for three days at the Holland State Campground and toured the area. Doesn't it seem we live in an area, but never visit the many great attractions practically in our neighborhood? The orchards are sporting bright red apples and the pumpkins are orange in the fields, perfect for fall decorating. At U-pick orchards, the apples on the lower branches are already harvested by children and short folks. Why does the best apple seem to always be in the top of the tree? De Zwaan means graceful bird. We visited Windmill Island Gardens to see this working windmill from the Netherlands. How interesting to see how it grinds the wheat into flour. The guides, Gloria, Virginia, and Linda, did a magnificent job of explaining all the gears and processes in this amazing 250 year old machine. I was delighted to learn the miller is a young woman and the only American woman certified by the Dutch Council of the Netherlands where she learned her trade. I was in awe of this strong, feisty woman after learning her job consists of climbing up and down the blades (which are reach 125 feet at the top of the blade, pushing the blades to face the wind via a wheel that turns the cap on top, and lifting fifty pound bags of wheat and pouring them into the chute to slide down to the mill stone for grinding. I won't even go into the maintenance that she does to keep the windmill in good shape. Definitely a GRRL in my book. The antique street organ was amazing. Inside the trailer size beautifully decorated cabinet were all the whistles, the tambourine, the drums to make a one-of-a-kind rendition of The Good Ole Summer Time. That song is still playing in my head. 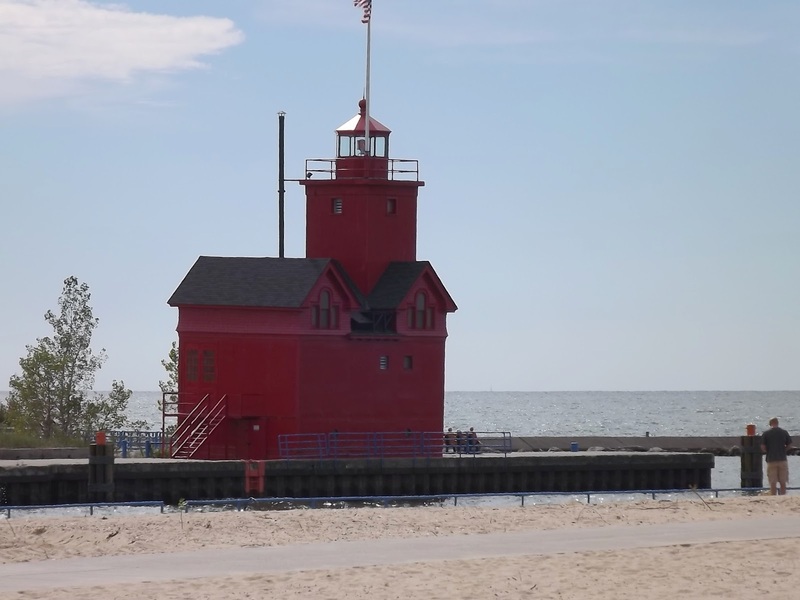 The old wooden lighthouse is the symbol of Holland, MI as are the magnificent tulips during the Tulip Festival in May. Crowds gather to watch the sun set into Lake Michigan. What a very special time of day. The beauty of this awe-inspiring display offers a splendid ending to an outstanding break from the ordinary. Thank you for stopping by. Have you seen a working windmill? Have you seen the wind turbine farms that now dot the landscape here in the Midwest? Old technology is new again! You can win this e-book! Wow, what an interesting trip! Lovely pictures! Thanks, Melissa. Great time of year to take off and get-away.